We offer short term intensive courses to those of you who wish to learn all the basics of pottery production in a short period of time. 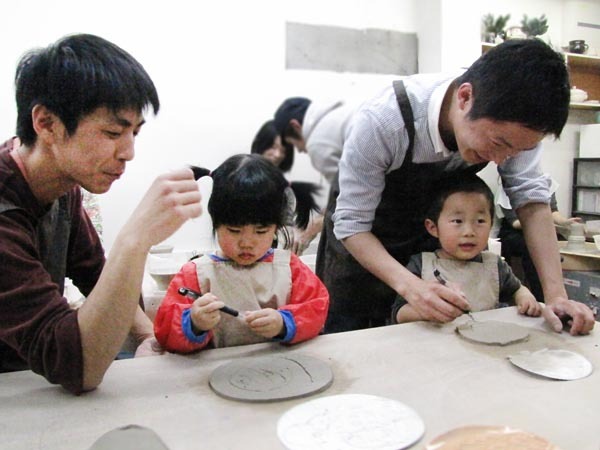 If you are in Japan for a limited time and you want to take more than three classes (if you are taking three classes or less in total, we recommend you to take our Trial Course) the Custom Intensive Pottery / Ceramic Course for Visitors is ideal for you. 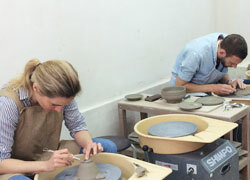 Our qualified instructors teach and mentor you in ‘rokuro’ (wheel throwing), ‘tebineri’ (handbuilding) and tile making techniques. Fees are determined on a case by case basis so please speak with our staff to find out more. We also offer an express firing service for students under a very tight schedule. Please click here to find out more. 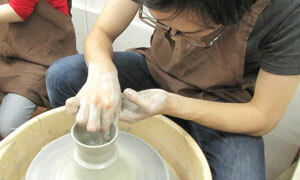 If you enjoyed the potter’s wheel as a beginner, you are sure to enjoy it as you become more experienced. As your throwing skills develop, our instructors will get you more involved in ‘kikuneri’ (wedging), ‘chuushin’ (centering), cutting and ‘kezuri’ (trimming / carving) on the potter’s wheel. There are many tools used during the wheel-throwing process, including tools for soaking water that accumulates inside works, cutting tools, measuring tools and a large range of shaping tools. ‘Tebineri’ (handbuilding) is very easy to pick up and we’ll walk you through the basic concepts during the first lesson. There are various techniques such as slab, coil and molds and similar to sculpture, possibilities are limitless. Persian / Turkish tiles have been revered throughout history as works of art due to the beautiful geometric patterns, bright colors and the artisan craftsmanship required in the production process. You don’t have to travel all the way to Central Asia to learn their techniques though – our instructors can guide you. We provide ready-made tiles so forming and trimming is not necessary – but if you are up for the challenge of making one from scratch, you are more than welcome to give it a shot. Trimming is essential for works made on the wheel. Benefits of trimming include more symmetrical and lighter works and a foot which makes it easier to handle tableware with hot food or liquid inside. Trimming techniques can also be used to make decorative patterns. You can either choose to trim works on a potter’s wheel by directly attaching the works on the potter’s wheel or using a ‘shita’ (chuck) if you have works where the base is much wider than the lip. 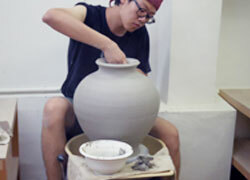 As you become more experienced, gauging the thickness of works and centering pieces will be easy. We have many trimming tools which you can use, including ‘kanna’ (trimming or cutting tools) and ‘kote’ (wooden shaping tools that can be used to smooth the surface of the clay after it has been trimmed). Bisque-firing is a vital stage in the ceramic production process as works need to be fired at low temperatures before they can be glazed or painted with underglazes. 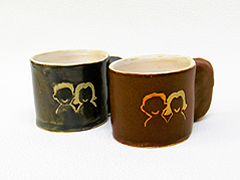 The resulting bisque-fired ware is hard and porous – ideal for ‘yuyaku’ (glaze) or ‘etsuke’ painting. Perhaps you have always been a strong painter or a skilled sketcher and would like to express your creative ideas on a piece of ceramic ‘canvas’. ‘Etsuke’ (painting) may be the answer. Our studio has a large selection of brushes and underglazes (painting on ceramics is done by oxides instead of paint that is used on paper) that you can use. Most of our instructors are experienced in ‘etsuke’ (painting) and some even have their own artistic careers that specialise in ‘etsuke’ (painting) ceramic works. Painting on tiles is very similar to ‘etsuke’ (painting) – except iron oxide is used as a separator for the different colors so they don’t mix. Iron oxide turns into a black colored outline when fired. 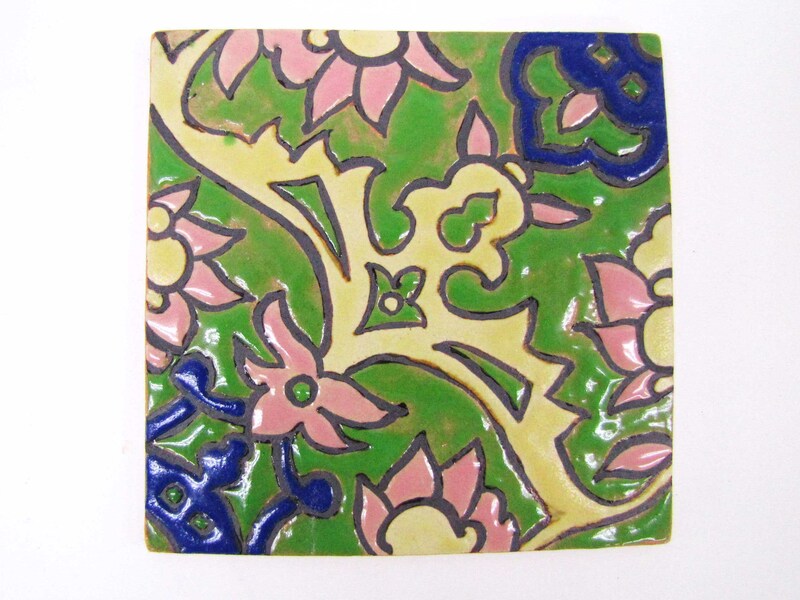 Images of intricate tile patterns are transferred to bisque-fired tiles using carbon paper. Earthenware is suitable for use as tableware and as vessels that contain fluids after glazing. Glazing is an essential stage in completing a work – prevents moisture from being trapped inside the ceramics (earthenware – works that are produced from the clay we use – are porous and moisture can get trapped inside, causing mold to form). Glazing is also highly appreciated as a decorative technique owing to the different colors that are achievable and the combination of different glazes that can be applied to the one ceramic work. For members who have painted works with motifs, it is recommended to use ‘toumei’ (transparent glaze) as the opaque nature of the other glazes may cover your paintings. Glazing application techniques also vary by ceramicist and country. We use traditional Japanese glazing techniques, with the aid of Japanese tools. As a member, you can experiment with the wide variety of glazes and tools we have at our studio. The final firing takes temperatures over 1,000 degrees centigrade. Luckily for everybody, the kiln does all the work for us. Like a baking oven – we just load the kiln with our works and wait for the goodies to cook. During this stage, the works have already been ‘cooked’ and we want the glaze ‘topping’ to work its magic and fuse with our works into a glassy coating. If you want to learn more about the technicalities of the final firing, please ask our instructors – they have a wealth of knowledge that they are willing to share with you.